Alameda's interim city manager and city attorney say emails among top officials discussing Mayor Trish Herrera Spencer's refusal to pay back $100 must be kept secret. In a move that First Amendment experts say appears to be illegal, Alameda Interim City Manager David Rudat and City Attorney Janet Kern have decided to help Mayor Trish Herrera Spencer keep city records that are damaging to her reelection campaign under wraps. In an email to the Express last week, Rudat and Kern claimed that emails among top city officials, including the police chief and assistant city manager, discussing Spencer's refusal to return $100 in checks that were supposed to go to the League of California Cities but ended up in her bank account are not "public records" and must be kept secret. First Amendment experts say the determination by Rudat and Kern is highly questionable and not supported by case law. Rudat and Kern have argued that emails regarding the mayor's actions are a "personnel" issue and thus exempt from public disclosure. David Snyder, executive director of the First Amendment Coalition, said it's "probably not correct to use a blank withholding of records under the 'personnel exemption.' As long as the allegation is well-founded, not invented, it is required they disclose those allegations to the public." Rudat and Kern's decision to help Spencer cover up her actions comes at a time when she's facing a tough reelection battle against two other councilmembers. As city employees who report to the council and not the mayor, Rudat and Kern are supposed to remain nonpartisan. Rudat did not return phone calls seeking comment for this report. In an email to the Express, he demanded that the newspaper not call the public records about Spencer's scandal "public records." The Express first reported about the issue on Oct. 3, in the investigative story, "Alameda Mayor Trish Spencer Has Yet to Return Missing Funds." 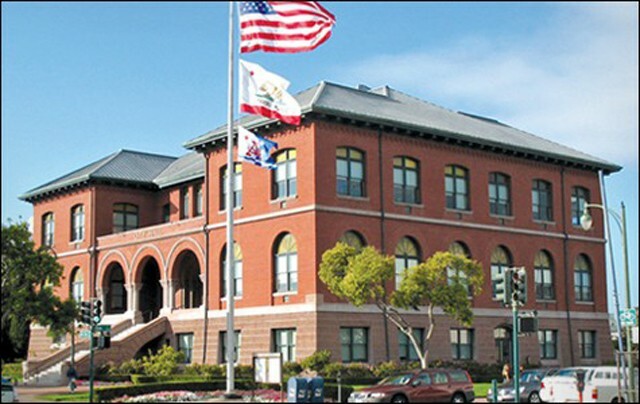 The report revealed that an investigation by the Alameda Police Department and the city of Alameda concluded that two $50 checks that the city asked Spencer to give to the League of California Cities to pay for dinners she attended were instead deposited into Spencer's Bank of America account. According to the records, police have also obtained security camera footage of Spencer's husband, Joel Spencer, depositing one of the two $50 checks into their bank's ATM machine on Park Street in Alameda. In one email, Police Chief Paul Rolleri wrote of Spencer, "Wow, she's something else. I find it more than a little ironic that she loves to scold people about 'the people's money' in open [c]ouncil meetings, but cannot see the ethical issue of her husband depositing a [c]ity of Alameda check at her bank's ATM." For her part, Spencer has contended that her bank told her they have no record of ever processing the checks. But the mayor has yet to provide evidence from her bank to substantiate her claims. By contrast, the Alameda Police Department has records from Spencer's bank showing the checks were, in fact, deposited into her account. Spencer has also argued that it was "illegal" for the Express to have received the public records. But Snyder of the First Amendment Coalition said Spencer's assertion is wrong — as long as the documents in question were not stolen or illegally procured by the newspaper. "There is a First Amendment protection of how records are gotten," said Snyder. "The public doesn't need permission to receive public documents. If so, the First Amendment would be useless." Alameda Assistant City Attorney Alan Cohen, who appears to have led the effort to help Spencer after she sought his assistance, said in an interview that the city has an obligation to protect the privacy of city personnel, including elected officials. "The implication [in the article] is that we disclosed [the records]." But Snyder said that under public records law, the actions of a mayor have more public importance than those of a low-level city staffer, and thus the city is limited in what it can block from release about a mayor. Spencer's explanation about her knowledge of the check scandal has also shifted repeatedly. When first approached in September about the two $50 checks — one deposited in February 2017, the other in August of the same year — the mayor said flatly that she was unaware there was an issue, despite emails going back to at least December 2017 that show she participated in an email chain discussing the matter with city's Finance Department. The tone of emails between Spencer and the Finance Department and separate communications between Alameda Police Chief Rolleri and Assistant City Manager Liz Warmerdam, sent between December 2017 and March 2018, also strongly suggest that the entire matter had greatly upset city officials. But in an email to the Express this week, demanding that the newspaper retract its story about the checks, Spencer stated: "In February, 2017, I informed staff the next day so they could put a stop payment on" one of the checks.